Pennsylvania is competing in the global marketplace, and, currently, we are coming in last. This must change. Employers are no longer bound by state, or even national, borders; they pick up their jobs and leave for more job-friendly locations. This is about work and economic opportunity – improving Pennsylvania’s climate to help workers achieve good-paying jobs and careers; improving a fractured workforce training system; and improving the business climate by cutting onerous bureaucratic red-tape and reforming the state’s tax structure – for residents and employers. 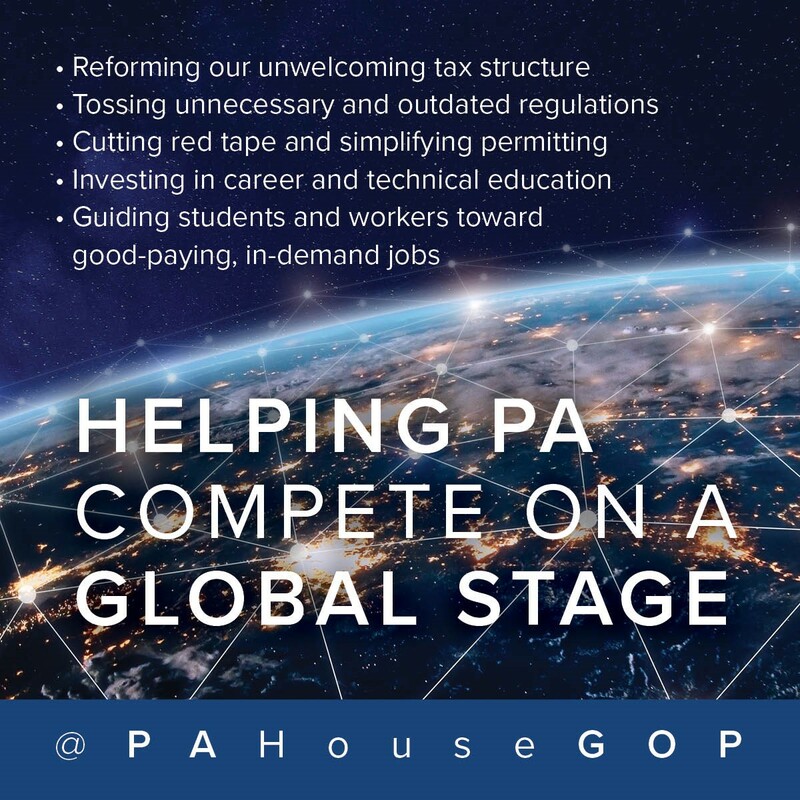 Here are the primary themes on which PA House Republicans are focusing efforts to help Pennsylvania to compete on the global stage. Welcome Employers through Tax Changes. The House Majority Policy Committee is working with the Tax Foundation to study the state’s tax structure from top to bottom. Recommendations will follow. HB 994 (Grove) - Updates the definition of mobile telecommunications to keep up with recent changes in technology. Prevents double taxation by clarifying the scope of the gross receipts tax and sales tax. This bill passed the House on April 9 and awaits Senate action. Prepare Workers by Educating for Success. - It’s not just about money but ensuring students graduate from school ready to succeed in the workplace and in life. • Building stronger awareness of Career and Technical Education (CTE) opportunities through tax credits, public/private partnerships, apprenticeships and other methods will better connect the state’s education system with the needs of job creators by helping upgrade the skills of an employer’s current workforce. The House Education Committee’s CTE Package – House Bills 2155-2159 and House Bills 2203 -2206. Learn more about these bills here. Be Job-Friendly with Regulatory Reform. HB 209 (Phillips-Hill) - Establishes an Office of the Repealer in Independent Regulatory Review Commission (IRRC) to undertake a comprehensive review of existing regulations in Pennsylvania and to make recommendations regarding repeal, modification, etc. The bill also includes a provision that requires an agency to identify two regulations for repeal when proposing a new regulation.This bill passed the House on May 1 and awaits Senate action. Learn more about this bill. HB 1237 (Keefer) - Directs the Independent Fiscal office (IFO) to prepare an independent assessment of the economic impact of some/all regulations. The legislation also subjects economically significant regulations to a vote by the General Assembly. While the Regulatory Review Act currently requires the promulgating agency to prepare information regarding the economic impact of a regulation on government and the regulated community, as well as on small business in the Commonwealth, as this estimate is prepared by the agency, some legitimately question the credibility. This bill passed the House may 1 and awaits Senate action. Learn more about this bill. HB 1959 (Rothman) and HB 1284 (Peifer) - Make a number of reforms to agency permitting: 1) require each agency to prepare and publish an inventory of permit types; 2) establish a permit tracking system; 3) require agencies to communicate more effectively with permit applicants regarding application deficiencies; 4) establish a program under which permit applications that are substantially delayed are referred to a third party professional for review. House Bill 1959 passed the House on May 1 and awaits Senate action. HB 1960 (Ellis) - Requires each agency to appoint a regulatory compliance officer to work collaboratively with the regulated community. This bill passed the House on May 1 and awaits Senate action.